These extraordinary opportunities have also propagated unanticipated pressure on the livability of cities that remains pervasive today. US cities are faced with new 21st century challenges aimed at corroding three interwoven drivers of livability: equity, safety, and affordability. These drivers have been the pillars of American cities, and are now being dangerously tested by the increasing pressures of urbanization. How will retail fit into the livable city of the future? Traditionally, local main streets with corner stores, community restaurants, and neighborhood shops were the suppliers of energy to sustain this civic ballet. Rapid suburbanization helped re-choreograph and focus this activity into shopping malls surrounded by sprawling roadways. Today’s trend is a return to urban living. Expanding urban centers and urbanized suburbs are different now, characterized by changing demographics, values and rapid adoption of new technology in all aspects of life, from mobility to e-commerce, augmented reality in communications – in short, the amplified smart city. Goods, services and sustenance remain at the center of urban life, and a measure of the livable city – exemplifying issues of equity, safety and affordability. Income inequality has risen 75% in urban centers over the past 20 years. Affordability at all levels from housing to food is constantly challenged. While urban crime in the US has steadily decreased over the same twenty years, recent studies also show that city living seems to increase sensitivity to social stress. Safety takes on a new dimension. How will retail continue to be a part of the social life of cities, redefining its relation to streetscapes and the public realm? How can, and will, this change the face of retail, and thus, our communities? 1. “WORLD CITIES REPORT 2016.” WORLD CITIES REPORT 2016, United Nations Human Settlements Programme, 2016, wcr.unhabitat.org/main-report/. PG 14. 2. “WORLD CITIES REPORT 2016.” PG 34. 3. WORLD CITIES REPORT 2016, United Nations Human Settlements Programme, 2016, wcr.unhabitat.org/main-report/. PG 69. You'll receive a confirmation email with the submission link included. This is an opportunity to propose a future for retail in the livable city of the 21st century. Washington, DC is currently the 22nd largest urban center in the US, growing at over 13% annually, and facing transitions mirrored in cities across the country. Using Washington, DC as an example, show us what might be. 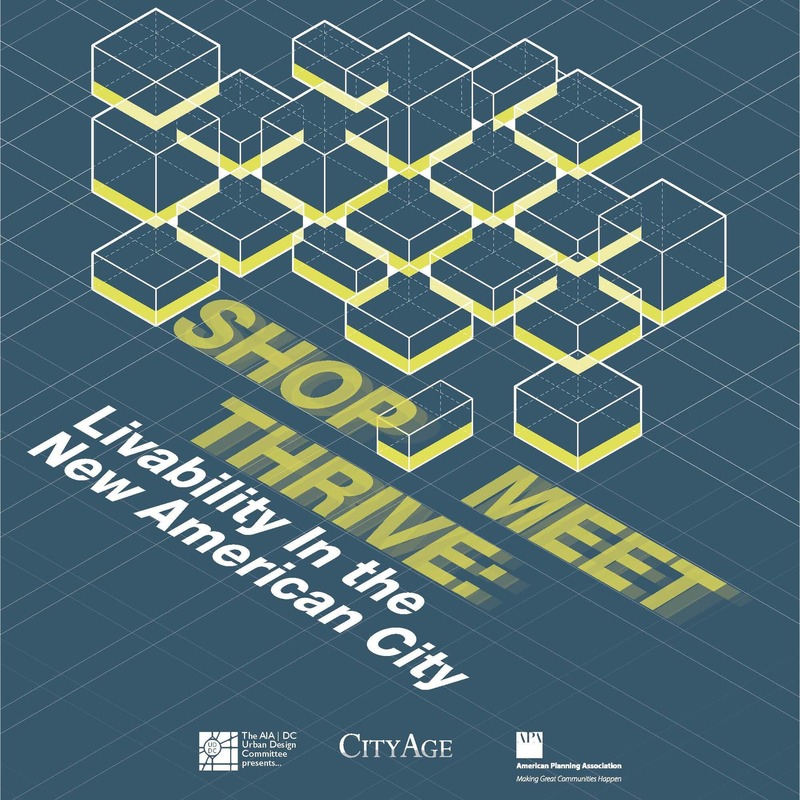 Focus on a driver of livability; address the specific challenges to retail in Washington, DC. Describe and illustrate a reimagined role or typology for the future of urban retail. How can DC’s avenues, streets, sidewalks and neighborhoods respond to the flourishing online marketplace? What will be the role of brick-and-mortar shops, how can urban warehousing progress, and how will District residential life, evolve? Considering changes in how we purchase goods, what new activities will replace traditional retail to sustain vibrant civic life? How will future mobility options influence the scale and character of urban retail centers? 10/25/17 - Registration begins. Limited brief released. 11/01/17 - Competition starts. Project location announced, full brief and base package released. 11/15/17 - Competition ends. Submissions are final. 11/22/17 - Finalists are announced. 11/29/17 - Finalists present live to jury and audience at CityAge. Jury gives live commentary. Any person or teams of up to five members may register and submit a competition entry. Multiple entries from the same person or team may be considered as long as each is registered and paid for separately and the content is not duplicated. Duplicated content will disqualify all entries involved. Any person that is a registered member of the AIA|DC Urban Design Committee is not eligible. If you have any questions about the eligibility requirements, please contact the AIA|DC UDC at aia.ud.dc@gmail.com. AIA|DC UDC shall have the sole authority to verify that eligibility requirements have been met. The jury shall have the sole authority to determine awards. The jury’s decisions shall be final and not subject to review. All entries will be anonymous up to the final selection. Finalists will be invited to present their submissions in person or remotely through online presentation at the awards reception in conjunction with the CityAge Conference The New American City on Wednesday, November 29th, 2017 in Washington, DC. An invitation for the submitting team to present at CityAge Conference to a live jury on November 29th, 2017. Free registration to AIA|DC’s next Urban Design Competition. Final awards will be announced live at the CityAge Conference the New American City, and winners will have the opportunity to be published in AIA|DC’s 2017 Urban Design Journal. All submissions are due by November 15, 2017 at 11:59pm EST. All submitted projects must be located completely within the Project Location of Washington, DC proper. All submissions must be digital and uploaded to the competition website. No compensations will be made for technical difficulties in uploading past the deadline. We encourage you to upload your submission early. No identifying information should appear within the content of the submission. A short narrative of 300-500 words is required. City-wide plan illustrating the location of the intervention site at any scale. Digital Submissions must be in one of the following landscape formats: 16x9 inches; 40.6x23 cm; 1280x720 px; 1920x1080 px; or 3840x2160 px. PDF submissions will have a 5page/slide limit. All submissions (regardless of format) are limited to 25 MB in size. All persons or firms contributing to the design of the project must be given due credit, regardless of their professional disciplines. It is incumbent upon the submitting person to provide a complete list of all participants contributing to the design. By submitting a project for consideration, the submitting persons represents and warrants to AIA|DC that he or she has provided a complete list. Failure to provide a complete list may result in disqualification and/or a referral of the matter to the appropriate ethics body of the national office of AIA. AIA|DC accepts no responsibility for incomplete lists. Although every reasonable precaution shall be taken in handling submitted material, the Chapter shall not be held responsible for loss of, or damage to, any submission. Acceptance of an award shall constitute an agreement by the entrant to authorize AIA|DC to reproduce any of the material described above for publicity purposes, and an agreement to indemnify and hold the Chapter harmless in connection with such materials. The jury’s selection will permanent and final. An impartial member of the AIA|DC Committee will serve as a moderator for the jury and provide written documentation of the jury’s selection. The jury will certify the accuracy and completeness of the documentation before the winners are announced publicly. Scoring rubrics and notes made by jury members during the jury’s closed session(s) will not be available to the public or participants. The Jury reserves the right to award winners, but is not required to do so if the entries submitted do not meet the objectives of the competition as stated in the brief.